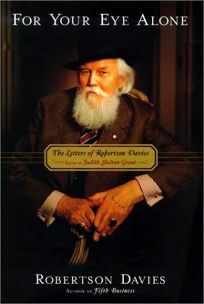 In amassing the first collection of the late Canadian novelist's letters, Davies's biographer Grant (Robertson Davies: Man of Myth) discovered many had actually been framed, which says something about not only Davies's status as grand old man of Canuck letters, but also their sheer entertainment value. This volume covers the years from 1976, when he was 63, to his death in 1995; during this period, he was at last a successful public figure, as the master of Massey College at the University of Toronto and the successful novelist of the Deptford Trilogy. His status is elevated enough that he not only helpfully blurbs aspiring novelists' works, but also burlesques literary critics and book reviewers (though he warns one lucky recipient, ""PS: Of course this letter is for your eye alone""). In the world of letters, his correspondents include fellow novelists John Irving, Mordecai Richler and Margaret Atwood, his editors and translators, and, of course, his readers, from schoolgirls to college professors. He deals with them all with equanimity and good humor, whether answering questions about his Jungian symbolism or explicating the Canada-Quebec culture wars and the propinquitous influence of the United States. As a public figure, he occasionally writes open letters to newspaper editors; in private his sentiments range from cheerfully curmudgeonly to plain irascible. His sporadic reminiscences about his early years in the theater in England and in provincial journalism might leave the reader wishing for letters from that younger Davies, but as these show, the great writer mastered the art of growing old gracefully and entertainingly. (Jan. 15) Forecast: Thanks to Davies's sterling reputation, this will be widely reviewed. Davies has legions of fans south of the Canadian border, and they will delight in this opportunity to meet the novelist in his own words.